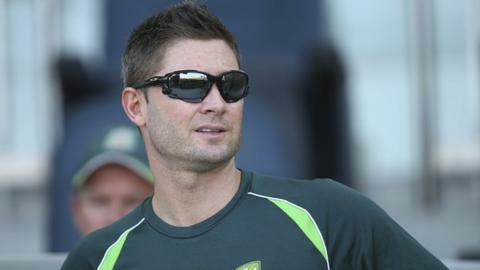 Australia captain Michael Clarke has been ruled out of the rest of the one-day series against South Africa after a recurrence of a hamstring injury. Clarke, 33, suffered the problem in his side's win in the first ODI and will miss the remaining four matches. "Michael will return to Sydney for further treatment," Cricket Australia team doctor Peter Brukner said. "An update on his fitness for the first Test in Brisbane [against India] will be made in due course." It is the third time Clarke has injured his left hamstring in the past six weeks, and he missed last month's ODI series with Pakistan. Meanwhile, Clarke's stand-in George Bailey and South Africa one-day skipper AB de Villiers have both been fined 40% of their match fees for maintaining a slow over-rate in that first ODI. The remaining players were docked 20%, as both teams were found to be two overs short of their target. More worryingly for both teams - with the World Cup three months away - if either Bailey or De Villiers commits one minor over-rate offence in the next 12 months, they will be suspended for one game by the International Cricket Council.